Thank you so much to all who donated to help support our trip to NYC! 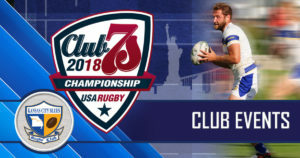 This past weekend the Kansas City Blues played in the USA Rugby’s Club 7’s National Championships at Columbia University in New York City. 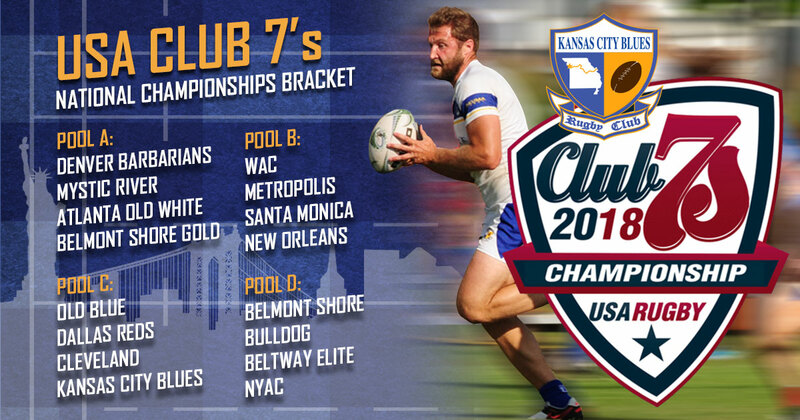 This was the 5th time since 2013 that then Blues have qualified for 7’s Nationals. The roster was comprised of 13 players (including an alternate). 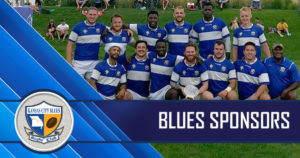 The 13 man roster was comprised of 6 veterans of 29 years of age or older (Kevin Schwartze, Kenny Scott, Cody Weber, Ed Mills, Scott McAvoy & David McDonough) who have all been to multiple Nationals 7’s for the Blues as well as Brendan Nachbar who was appearing at his 2nd 7’s Nationals for the Blues. The remaining 6 players on the roster were 23 years old or younger and were all making their first appearance at 7’s Nationals (Jabaree Leopold – Iowa Central, Aren Martin – Pitt. State, Dalton Humphrey – Pitt State, Gio Falco – Lindenwood, Sam Chapman – Lindenwood, Greg Fry – K-State). Of the 13 players, only 3 were on the 2016 Nationals Roster which goes to show the depth the 7’s program has achieved over the years. One of the main contributors to this depth has been the 7’s Academy which has helped develop younger players in the program. 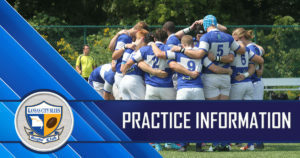 The Nationals roster featured 6 players who had previously participated in the Academy system as well as 9 total local players, including three former Junior Blues & one Aquinas Rugby alumni. On day one of the tournament, the boys took on a very tough pool, a pool that FloRugby called the “Pool of Death” for the tournament. In their first pool match the Blues faced the Dallas reds who had not lost a match all summer. The Blues started slow and then fought back hard to lose a close match by a score of 21-14. In match number two of the day the Blues took on the top seed in their pool and perennial 7’s power, New York Old Blue. Amidst a downpour the Blues struggled to find continuity on offense and dropped the match 24-7. In the final pool play match of the day the boys found their stride against Cleveland Rugby Academy and won handily by a count of 33-7. Tries were dotted down by Jabaree Leopold, Cody Weber, David McDonough, Brendan Nachbar & Greg Fry. As he has done for years, Kevin Schwartze change the dynamic of the match with his great aerial work, stealing several kickoffs which helped starve Cleveland of possession. Unfortunately with a record on 1-2 in pool play the Blues were sent into the Bowl bracket for Sunday which was the bottom 8 teams which would compete for the Bowl Title and 9th place in the country. After finding their stride at the end of Day 1 the one boys cruised through their first two matches of the day with commanding victories over New York Athletic Club (45-0) & New Orleans (26-7). In the Bowl Championship the Blues took on a very tough Beltway Elite squad out of the Baltimore & Washington DC area. The Blues jumped out ahead with some great running by Brendan Nachbar, Dalton Humphrey & Aren Martin. After a back and forth match the Blues salted the match away with the final try of the match by Kenny Scott and won 26-17. The final 4 matches of the tournament saw the Blues completely outclass the bottom half of the Nationals bracket by a combined score of 130-31 to win the Bowl Championship and earn 9th place. This is the 4th top 9 finish for the club in the last 5 years (2014 – 3rd, 2015 – 9th, 2016 – 2nd, 2018 – 9th) and an overall record of 17-7 at Nationals in this time span which is a feat of consistency that only a very select few clubs can claim. 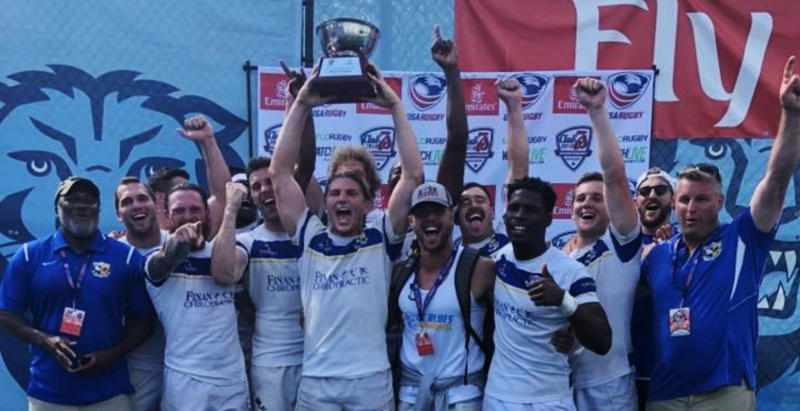 Hats off to Coach Kram and his staff (Chris George, Markus Valovalo, Darlwin Nelson, Joe D’Agostino, Ken Woods) on another successful summer of 7’s! One notable exception to the Nationals roster was Ani Mteto. Ani played Center for us all summer and was our kickoff specialist as well but was unable to attend Nationals due to being invited to the Collegiate All-American 15’s camp (yes, USA Rugby, in their infinite wisdom, scheduled these events on the same weekend). To no surprise Ani excelled at camp and will be representing the Collegiate All-Amercians this weekend as they take on Glendale. Also of note, Ani & Jabaree Leopold will both be representing Denver Elite next weekend at the Rugbytown 7’s as well so several of our young players are getting National recognition. 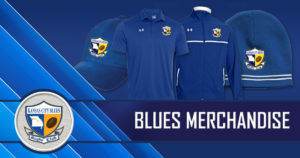 Please become familiar with these outstanding partners to the KC Blues, and do your best to support those who support us!